Some clouds early. Mostly sunny skies along with windy conditions this afternoon. High 63F. Winds WNW at 25 to 35 mph. Winds could occasionally gust over 40 mph..
A view of the Walmart site from Tucker Road. A view from Tehachapi Boulevard shows the Walmart construction that is underway. Progress is made on the block infrastructure on the Walmart site. Dirt is still in the process of being moved around at the Walmart site, at the intersection of Tehachapi Boulevard and Tucker Road. Preparation for the Walmart site foundation is underway. Walmart infrastructure, including block walls, are being constructed at the property. Crews are making progress on compacting dirt and preparing the area for the foundation for the 151,000-square-foot Walmart store at Tucker Road and Tehachapi Boulevard. Walmart broke ground more than a month ago. Multiple Caterpillar vehicles and heavy equipment continue to move large amounts of dirt to specific places, according to plans given to Eleven Western Builders Inc. by Walmart. Workers for Eleven Western Builders Inc. are busy building block walls and following plans for layout of the building construction, parking lot and other needed items. 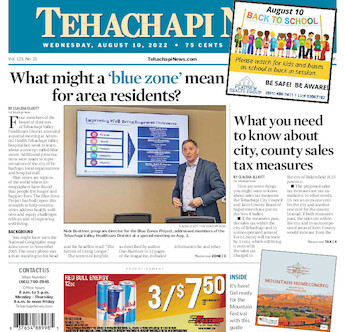 Walls, framing, curbs and gutters and other progress is being made at the 151,000-square-foot Walmart store at Tucker Road and Tehachapi Boulevard.